…Who deals with all that stuff? Our members do! 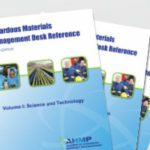 The Alliance of Hazardous Materials Professionals (AHMP) is the recognized global leader and resource for hazardous materials and hazardous waste professionals, including the CERTIFIED HAZARDOUS MATERIALS MANAGER (CHMM) and related professional designations. Advancement of the careers of professionals that are passionate about Environmental, Health, Safety & Security management.